Tangla Hotel Brussels offers a refined and elegant setting for your corporate occasion. Its strategic location in Brussels, on-site parking and wide offer in meeting rooms are the right ingredients for your company's tailormade event. Tangla Hotel Brussels is dedicated to creating and hosting a successful event for your company through our personalized services and elegant venues. We understand your productivity needs to be on point. Event organization can be stressful at times. So let us take care of the organization for you. Willing to fulfill the Tanggula mountains' Legend, the reach of high level serenity is our motto and promise to our guests. Don't think twice and ask for your personalized quote today. Our Event designers will be glad to assist you and be your partner in your event organization. Discover our package options! Simplify your meeting planning with one of our customizable meeting packages. If you cannot find what you are looking for do not hesitate to contact us directly. It would be a pleasure to create your own personalized event that meets your needs and beyond. Care for a KARAOKE ? Enjoy China's favorite past-time and indulge yourselve in the guilty pleasure of karaoke. 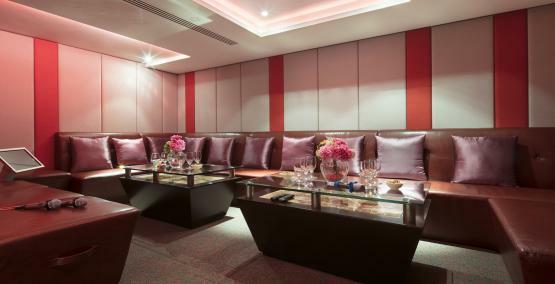 The KTV or Private Karaoke space is located underneath the T Lounge and can accomodate up to 20 people. Have a go at displaying your vocal talents in an intimate and elegant setting while enjoying a night out with friends or colleagues.